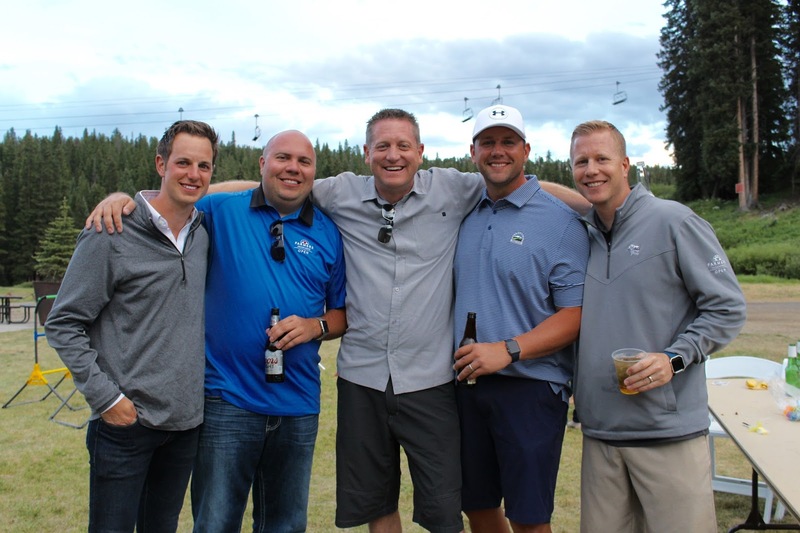 Last week Matt and I went to Breckenridge for a few days for a Farmers Insurance promotion! My husband and 7 of the other District Managers took care of this for the qualifiers and there were 300 people in attendance! Thursday Matt and I took the 2 hour drive up to the high country and stopped for a fun picnic lunch in Georgetown on the way! You know people love Colorado in the winter, as do I but I LOVE it in the Summer! Everything just comes alive and is so lush and pretty! I have never been to Breck before and the stream running down main street is just so charming! Matt golfed with the guys (typical) and I did a little shopping and relaxing. Our room was at Beaver Run and was a 2 story cabin thing and this was our view… not bad! Those clouds look fake they are so perfect! Thursday night we went to have a nice dinner at Hearthstone one of the best restaurants in Breck and it did NOT disappoint! It was housed in a 100 year old Victorian home, I just loved it! Ha, the sun was SOO bright I couldn’t look up at Matt while he took the pic, I swear! But this was my night out look via Anthropologie and I thought it was the perfect “mountain” look! And I felt so good I got so many compliments from nice strangers! I also got to spend a little time at the Beaver Run spa and relaxed with a massage! And this huge salt water hot tub was great…. I stayed in so long I got pruney! Friday night was the BIG Farmers Family BBQ and I got to play photog! I felt so professional, I took around 200 pics of the events and the families attending…… luckily we got one of the two of us! Matt had a great time, these guys really out did theirselves! And the setting, the weather was all just perfect! Beautiful scenery and I too love your outfit. and Congrats on a great company event for the Promotions. I know Matt works hard as a DA, and it is good that he can recognize those that work hard too, in a fun getaway. Your spa time was a bonus sounds like.